Back in October, I wrote about US Fish & Wildlife biologist Eric Regehr comments about a recent survey of Chukchi Sea polar bears, the results of which are still not published. Since then, I’ve been able to track down a bit of information. This project appears to have run for five years, from 2008 to 2011. The work was confined to the eastern (US) portion of the Chukchi, see maps below (Polar Bear News 2010; Rode and Regehr 2010). Researchers were doing mark-recapture work with helicopters, putting radio collars on some females and radio ear tags on a few males. They worked primarily in March and April (mating season for polar bears), operating entirely on the offshore sea ice – working, I might add, on bears that technically speaking do not exist, since the official population estimate for this region is “zero” (they are not included in the global estimate of 20,000-25,000, see pdf here,, discussed here). Figure 1. 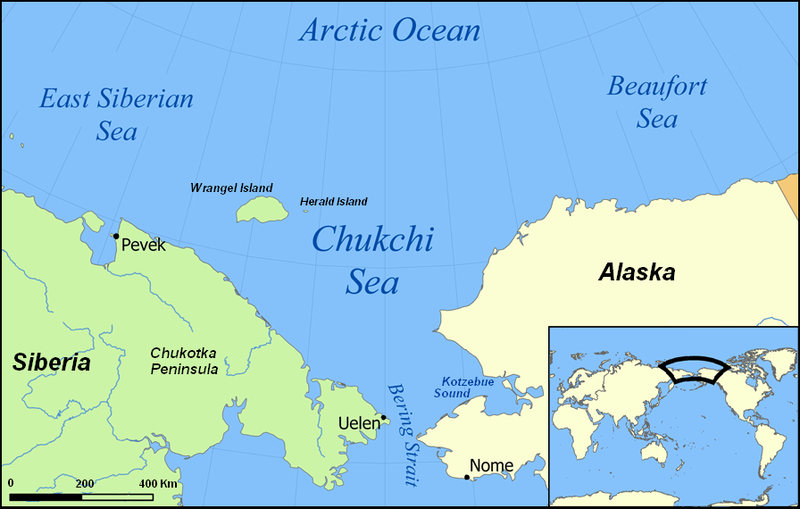 Chukchi Sea – getting you oriented. Note the location of Kotzebue Sound, northeast of the Bering Strait. Map from Wikipedia. In 2012, US Fish & Wildlife biologist Eric Regehr told reporter Jill Burke at Alaska Dispatch that they found the bears were “reproducing well and maintaining good body condition.” I’ve finally found some details regarding what he meant by that statement (although no final reports or peer-reviewed papers are out, see footnote below).